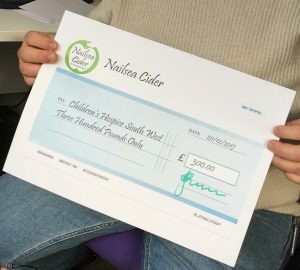 Yesterday afternoon (Wednesday 20th Dec) Phil, Paul & Mike visited The Children’s Hospice South West (CHSW) at Charlton Farm, Wraxall, to meet Community Fundraiser Kylie Gallagher and present a cheque for £300, which was raised selling Mulled Cider at the Nailsea Christmas Fair. During the year CHSW offered the excess apples from their orchard to Nailsea Cider. We decided to show our thanks by mulling some of our cider and selling it at The Nailsea Christmas Fair on 1st December. 100% of the sales of this was donated to the Hospice. We were very proud not to take anything from the sales for ourselves, donating the cider, spices, heat and our time. We hope that this will be the start of a long and fruitful partnership.